Arizona health care reform update for 2015. On March 23, 2010, President Obama signed into law a comprehensive health care reform bill, the Affordable Care Act (ACA). The ACA includes numerous reforms aimed at improving the U.S. health care delivery system, controlling health care costs and expanding health coverage. The ACA’s reforms have staggered effective dates, with many key reforms taking effect in 2014. The ACA is a federal law, which means that federal agencies, namely the Departments of Labor, Health and Human Services and the Treasury, are primarily responsible for the law’s overall enforcement. However, the ACA also creates significant responsibilities for state governments. A number of the ACA’s key health care reforms will be carried out at the state level. This Employment Law Summary provides a high-level overview of selected ACA reforms to be implemented by state governments and highlights the progress being made in Arizona. The ACA requires each state to have a health insurance exchange (Exchange) to provide a competitive marketplace where individuals and small businesses can purchase affordable private health insurance coverage, effective Jan. 1, 2014. The Exchanges opened for enrollment on Oct. 1, 2013. According to the Department of Health and Human Services (HHS), the Exchanges make it easier for individuals and small businesses to compare health plan options, receive answers to health coverage questions, determine eligibility for tax credits for private insurance or public health programs and enroll in suitable health coverage. Individuals and small employers are eligible to participate in the Exchanges. Under the ACA, a “small employer” is an employer with not more than 100 employees. However, for plan years beginning before Jan. 1, 2016, a state may elect to define “small employer” as an employer with not more than 50 employees. Beginning in 2017, states may allow businesses with more than 100 employees to participate in the Exchanges. Partner with HHS so that some FFE Exchange functions are performed by the state. In addition, a state could elect to partner with HHS so that the state runs the Exchange’s small business health options program (SHOP) component and HHS runs the Exchange’s individual market component. In states that did not move forward with their Exchange planning or select the partnership model, HHS operates the FFE. Arizona has defaulted to the FFE. Thus, effective Jan. 1, 2014, HHS operates the FFE for Arizona’s residents. Beginning in 2014, the ACA requires non-grandfathered plans in the individual and small group markets, both inside and outside of the Exchanges, to offer a core package of items and services. This core package is known as essential health benefits (EHBs). Under the ACA, EHBs include items and services in 10 general benefit categories, including hospitalization, maternity and newborn care, mental health and substance use disorder services and prescription drugs. If a state did not select a benchmark, HHS selected the largest plan by enrollment in the largest product by enrollment in the state’s small group market as the default benchmark plan. The benchmark plans have been finalized for benefit year 2014. 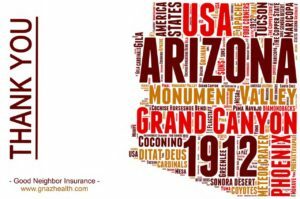 Arizona selected the State Employee Benefit-United Healthcare EPO plan as its EHB benchmark. More information on Arizona’s benchmark plan is available on The Center for Consumer Information & Insurance Oversight (CCIIO) website. When it was passed, the ACA required states to expand Medicaid eligibility by providing coverage for adults between ages 18 and 65 with incomes up to 133 percent of the federal poverty level, regardless of their age, family status or health. Because of the way this is calculated, it effectively includes individuals with incomes up to 138 percent of the federal poverty level. In 2012, the U.S. Supreme Court made it optional for states to expand their Medicaid eligibility. In addition, the ACA provides tax credits or subsidies for people with incomes between 100 percent and 400 percent of the federal poverty level to buy health insurance through an Exchange. Employees who are eligible for Medicaid cannot receive Exchange subsidies. Starting in 2015, applicable large employers (50 or more full-time employees, including equivalents) may be subject to a “pay or play” penalty if one or more full-time employees receives an Exchange subsidy. (Applicable large employers with fewer than 100 employees may be eligible for a one-year delay of the pay or play rules, until 2016). Employers with employees in states that opt out of the expanded Medicaid eligibility may face an increased risk of penalties under the pay or play rules because fewer employees will be ineligible for subsidies based on Medicaid eligibility. Arizona expanded its Medicaid program in 2014 to cover households with incomes up to 138 percent of the federal poverty level. The federal poverty level guidelines for 2014 are available at: http://aspe.hhs.gov/poverty/14poverty.cfm. To make health insurance coverage for small groups more affordable and apply additional consumer protections (for example, the restrictions on using health status factors in setting premium rates), the ACA expands the small group market. Under the ACA, a “small employer” is an employer that employed an average of at least one but not more than 100 employees on business days during the preceding calendar year and who employs at least one employee on the first day of the plan year. However, for plan years beginning before Jan. 1, 2016, a state may elect to define “small employer” as an employer that employed an average of at least one but not more than 50 employees on business days during the preceding calendar year. Thus, states have the option to delay the ACA’s expansion of the small group market. Most states have defined a small employer as one with 50 or fewer employees. Arizona law defines “small employer” as an employer that employs at least two but not more than 50 eligible employees on a typical business day during any one calendar year. To comply with the ACA, Arizona must expand its small group market by Jan 1, 2016 to include employers with 100 or fewer employees. To help hold insurance companies accountable for their proposed rate hikes, the ACA required HHS to establish a process to review the reasonableness of certain premium increases. According to HHS, Arizona has an effective system for reviewing rate increases in the individual market, but not in the small group market. The Arizona Department of Insurance conducts rate reviews for individual insurance policies, while HHS conducts rate reviews in the small group market. Effective for 2014, the ACA requires health plans and health insurance issuers to comply with an additional set of insurance market reforms. For example, effective for plan years beginning on or after Jan. 1, 2014, health plans and issuers cannot impose pre-existing condition exclusions on any enrollees. States have traditionally been the primary regulators of their health insurance markets. The ACA allows states to continue in this role, but does not require states to enforce the ACA’s reforms. If a state chooses not to enforce the ACA’s insurance reforms, the federal government will assume that role. Although states have varied significantly in their approaches to implementing the ACA, many states have enacted laws related to the market reforms. The Arizona legislature has enacted laws to implement the ACA’s insurance market reforms. Arizona is also taking an active role in enforcing the ACA’s market reforms. State regulators perform functions such as collecting and reviewing policy forms for compliance, responding to consumer inquiries and complaints and taking enforcement action as necessary. Effective for plan years beginning on or after Sept. 23, 2010, the ACA requires group health plans to extend dependent coverage up to age 26. Some states may have laws that go beyond the federal minimums established by the ACA. For example, some states extend dependent coverage beyond age 26. Arizona law does not generally require insured health plans to maintain dependent coverage past the federal minimum, although it does require insured health plans to extend coverage past the policy’s limiting age for disabled dependents. The ACA amended the federal tax code so that, for federal tax purposes, the value of employer-provided coverage for young adult dependents is excluded from the employee’s gross income through the tax year in which the dependent child turns 26. Arizona amended its tax rules, in HB 2008, to follow the federal tax rules regarding the taxation of health insurance coverage for adult children. Because of this tax law change, Arizona employers are not required to report and withhold income on the value of health insurance coverage provided to adult children through the end of the year in which they obtain age 26. However, health coverage for an adult child after the year in which the child turns age 26 will be subject to federal and state tax, unless the child qualifies as the employee’s tax dependent. The ACA requires non-grandfathered group health plans to follow minimum requirements for external review of claims appeals. Insured plans must comply with their state’s external review process if it includes certain minimum consumer protections. If a state’s external review process does not include the required minimum consumer protections, health insurers in the state must comply with a federal process for conducting external reviews, effective Jan. 1, 2012. HHS determines whether a state’s external review process includes the minimum consumer protections. HHS has concluded that Arizona’s external review process includes the minimum consumer protections. Thus, insured health plans in Arizona must conduct external appeals in accordance with the state’s external review process.